An international team of researchers affiliated with South Korea's Ulsan National Institute of Science and Technology (UNIST) has carried out a scientific investigation on dolphin liberation in South Korea. "Dolphin liberation in South Korea has raised awareness of the welfare of marine animals and has resulted in the strengthening of animal protection policies and the level of welfare." 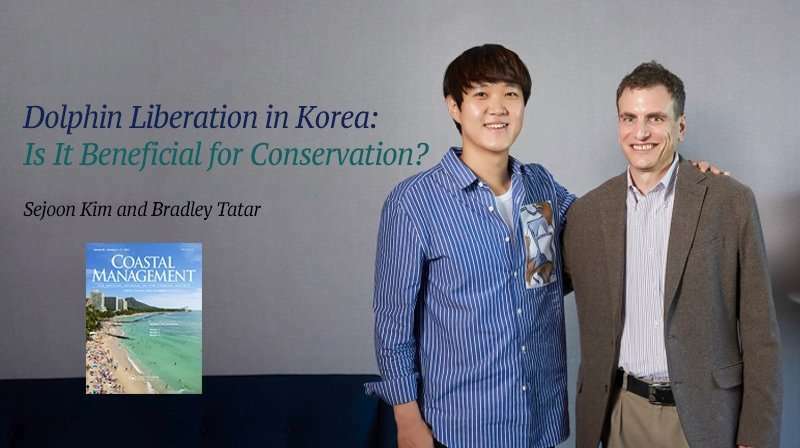 An engineering student affiliated with UNIST has recently carried out a scientific investigation on dolphin liberation in South Korea. The paper presents the overall analysis of the social impact of the first case of dolphin rehabilitation in Asia, which occurred in 2013. This study has been carried out by Sejoon Kim in the School of Energy and Chemical Engineering in collaboration wit Professor Bradley Tatar in the Division of General Studies at UNIST. Their findings have been published in the April issue of the journal Coastal Management, and will be published online this month. "After the release of captive dolphins from South Korean marine parks, there has been a growing environmental movement towards the conservation and management of marine and coastal ecosystems," says Sejoon. "Although such movement relies on a single-species conservation focus and does not encompass an entire ecosystem, it has enormous symbolic significance for the welfare of marine animals."